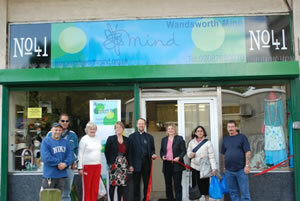 Justine says "It was great to open the new Wandsworth Mind shop in Roehampton. All the staff and volunteers have worked really hard to get the shop looking fantastic. Wandsworth Mind does some great work through its shop and has some great deals if you want to pick up a bargain!" The shop has previously been voted best value shop in the borough and with a wedding dress with lace sleeves and a blue tie dress on sale could it be said that the best people donate to No 41? Kate Whalley the manager at Wandsworth Mind thanked all the people who have made the shop such a success, the hard work of the manager and volunteers, the customers and the people who donate to the shop. High quality clothing is always gratefully received. For more information please contact Kate Whalley on 020 8875 9162.